This week, students have two sessions in the computer lab. These sessions are intended to begin working on the project (a series of tasks) on the platform Career Cruising. Some students are working with me to complete their Self-Reflection and Assessment project by going through the Request to Resubmit / Reassess process (for details please see the landing page of this website). This week Natalie Thiverge from Workplace Safety Yukon came to speak to students about workplace safety and risks of impairment. This week we continued our recent pattern of alternating days in the lab (some students are still finalizing their Self-Assessment/Self-Reflection project. Projects will not be accepted for resubmission without a completed Request to Resubmit process. Others have already begun work on Career Cruising. Please note that if they so choose, parents can be provided access to their child's/ward's Career Cruising portfolio online. Please contact Ms. Carrey for the necessary information for your child's specific portfolio (the information can only be accessed by individuals who have the passwords/code - the student and their parents/guardians - or the course advisors). We also had a visit on Wednesday from Natalie Thiverge of Worksplace Safety to discuss worker rights and responsibilities around safe behaviours and impairment in the work environment. This week we continued our look at unusual jobs and the ways that job/occupation/career choices reflect a person's skills, priorities and interests. Students also had two days in the lab to complete their self-reflection projects (Tuesday and Friday). Even with absences, most students have had at least 4 x 80 mins sessions in the computer lab, so over 5 hours. In addition, at lunch there are labs open (I supervise this every other week) and when I'm not supervising in the lab, I'm in my classroom (where I have three available computers because I can let students use my teacher laptop). Students have had a month to work on this, were provided with tutorials, a to do list to break down the tasks, links, and exemplars. Nonetheless, some students were still working on or restarting the first steps of the project on the last day of the week this week. Students are accountable for meeting deadlines and using the provided resources (including asking for and accepting help from the instructor and the EA) in order to complete required work in order to provide evidence of their mastery of course content and competencies. Students who have not done so will need to complete a "Request to Re-submit", negotiated with the instructor and signed off on by parents. Students who have not submitted the work and/or do not fill out a Request to Resubmit and then meet the terms of the plan for resubmission will be missing that piece of evidence for the curricular competencies and content covered in that assignment (please see assignment below). A lack of evidence on those curricular elements can have a negative impact on student achievement. Students know that they must have this course to graduate and that this course is not available in summer school. We had a visit on Wednesday, February 27th from the RCMP talking about the implications of the legalization of cannabis, and on Thursday students attended a presentation by the senior Drama class. This week we began looking at some careers that might be considered unusual. The reason for this is that students will shortly be starting work on Career Cruising, and will be investigating career paths, from education or certification require through market trends etc. Very often, we learn about the most common or basic versions of career types or "clusters". Our modern society, however, is complex and the needs of such diverse populations (age, interests, socio-economic levels, health communities, special interest groups) mean that there are opportunities for jobs, occupations and careers that some people never even hear about. The key here is not to promote any particular "unusual" career path, but to get students to think (a) outside of "the box" of what they may already be aware of, and (b) to consider how they might choose to use their interests, skills and learning to make a living by providing a service or product to others. We are watching videos about and reading about these jobs and then considering how they can reflect a person's priorities and skills and how they offer something unique to their clients/customers. Why pursue an ordinary job when so many fascinating and unique careers now exist? Forget about all the run-of-the-mill options that make you want to poke your eyes out or take the next flight to Mars. You only live once. And you're not about to settle for being a lemming. From the crazy to the cool, the serious to the silly, there are tons of ways to make money. Here are the top 15 most unique, weird, and interesting jobs. By Al Donato Kirkland Gates, Patty McGill and Dandy at Hinchinbrook Farms More and more Canadians are horsing around with their healthcare. Horse therapy, also known as equestrian or equine-assisted therapy, is a versatile treatment program that has patients galloping to ranches and stables to recover from all kinds of medical conditions. Having learned about the difference between enjoyable, pleasant moments (short-term happiness) and elements of a fulfilling life (long-term connections, belonging) students have had the opportunity to begin inventorying their character strengths, preferences, and skills. The next step is to reflect on this information and start looking at how this knowledge and self-understanding can be translated into actionable goals and objectives. In order to make effective and plausible plans for moving forward, we need to first reflect on ourselves, our current patterns and coping strategies and to identify our priorities. The results of this work will also be incorporated into the Mirror, Mirror assignment (please see below). We discussed key understandings from these videos, including (please note: the video on the right we only watched about 15 mins and 25 seconds - the rest isn't really relevant to us right now). Goal setting is not, in fact rubbish (it's a click bait title) but as per earlier learning about focusing on meaningful life experiences we wish to have, life-long learning we wish to engage in and the ways in which we hope to contribute to our social communities are the kind of end goals that help us to make healthy and effective choices about how we manage our priorities and our time. What Are Your Priorities, Really? Do you ever find yourself complaining about some aspect of your life -- family, work, health, etc. -- some aspect that you claim to be important to you? If so, are you spending more time complaining about that area of life than you are actually doing something about it? Sadly, I was very sick on the last two days of Week 2. Students did some initial readings preparing for discussions this week. Deliberate attempts to study and quantify intelligence date back to the late 19th century (see article below from the World Economic Forum). We seem to have a human tendency to want to quantify and categorize people and objects in our environments. It should not be surprising that these tools were quickly seized on by different industries and areas of study to try and meet a range of purposes. Several of these tests are used by corporations and organizations in the hopes of choosing the best employees, designing training programs and helping employees to improve their skills. What are the commonly used and accepted personality and/or "type" tests/indicators? What do they intend to measure/assess and how are they used in work applications? How thorough, scientifically accurate and precise are these measurement tools? How can individuals use these as tools for self-reflection, goal setting, planning and decision making? Students have already begun to take some of these tests. Now we begin to take a critical look at the tests themselves so that students can effectively evaluate and reflect on their own results. First - The old standby, the IQ (Intelligence Quotient) Test, and the more modern compliment, Emotional Intelligence. How has intelligence testing changed throughout history? The scientific study of human intelligence dates back well over 100 years. In that time there have been numerous schools of thought about how to measure intelligence. The core disagreement between researchers and theorists about intelligence is around whether it's genetic or largely influenced by the environment; whether it's nature or nurture. My name is Adam Grant, and I am an INTJ. That's what I learned from a wildly popular personality test, which is taken by more than 2.5 million people a year, and used by 89 of the Fortune 100 companies. Opinions expressed by Entrepreneur contributors are their own. Scholars may have coined the term "emotional intelligence" in the early 1990s, but business leaders quickly took the concept and made it their own. According to emotional intelligence, or EQ, success is strongly influenced by personal qualities such as perseverance, self-control and skill in getting along with others. The theory of multiple intelligences challenges the idea of a single IQ, where human beings have one central "computer" where intelligence is housed. Howard Gardner, the Harvard professor who originally proposed the theory, says that there are multiple types of human intelligence, each representing different ways of processing information: Verbal-linguistic intelligence refers to an individual's ability to analyze information and produce work that involves oral and written language, such as speeches, books, and emails. Two tools that can be used to provide insight into personality, but based on current, modern psychological research. They are the VIA Character Strengths, based on Martin Seligman's work around PERMA/Flourishing, and the Big Five Personality Domains. Sharing is caring. Everyone seems to be in the pursuit of happiness nowadays. There are many ways to reach happiness, though including training your mind for happiness, spending money on others to promote happiness, and following thecode to well-being and happiness. I have created this page to address a few of the more common nuts-and-bolts questions people have about measuring the Big Five. I have written this page in a fairly informal style, and I have not attempted to be comprehensive. So this week, we've reviewed several self-reflection or assessment tools that use "tests", "quizzes" or, more appropriately, survey questions to help people to identify their personal skills, priorities, values and strengths. We discussed the fact that some widely used "tests", for instance the ubiquitous Myers-Briggs Personality Indicator, are deeply flawed tools based more on philosophy and a fairly common human desire to categorize ourselves, but not consistently backed up by reputable research that replicates consistent results. Unlike "IQ" tests, which have been proven to measure only a limited number of skills (and not actual intellectual ability), and unlike the Myers-Briggs, there are some self-assessment tools that are based in research (specifically, in this class we looked at M Seligman's VIA Character Survey). However, even scientifically validated (or perhaps especially scientifically validated studies) allow for the fact that human beings are complex organisms and that our personalities, skills/strengths, priorities and values are dynamic, constantly subject to change based on our circumstances and life experience. Nonetheless, there is potential benefit in correlating results from several types of tests in order to see whether or not there are patterns and to use the results as a tool for engaging in self-reflection as a starting point for making choices from any given starting point. The key is to keep in mind that this process of self-assessment must be ongoing - we need to take time to reflect on our priorities, skills/strengths, areas for improvement, our values, ethics and morals and our goals on a regular basis in order to adapt our plans and goals to our needs and circumstances as we move through our life. On Friday, February 8th, most of the Career and Life Education 10 class attended the PARTY program at Firehouse 2 (top of Two Mile Hill) here in Whitehorse. Over the course of the day, several local Emergency Services professionals volunteered time on their days off (or from their retirement) to come talk to us about their work and about the evidence they see in the course of that work of the consequences of high-risk behaviour among youth. Students have an assignment attached to this presentation, whether or not they were in attendance. Links will be included here that will help students to complete the work, and one student in the class who took detailed notes has generously offered to let those notes be copied so that other students may use them for reference. We would like to express our gratitude to everyone who came to speak to us on Friday: Sarah McGrath (PARTY Program Whitehorse), Jon Trefry, Rob Morris (EMS Whitehorse), Kathleen Froese (RN, Whitehorse General Hospital), Dr. Bob ZImmerman (Ret. ), Darryl Tait (Para-athlete), Sean Cooke (Whitehorse FIre Department), and Jim Giczi (Whitehorse, Yukon RCMP Forensics Unit). Students - all students - will also be writing a thank you letter to Sarah McGrath and those who volunteered to share their time and knowledge with us on Friday. That will happen after they have completed these questions, so that they have content to draw on for their letter. Paramedics are drawn to ambulance lights like moths to a flame, yet they know the thing that brings life can also burn them. For Chris Carson, the call he was drawn to, the one that still smolders inside him, came on June 15, 2012. Ever wondered what it's like to work in an emergency room? Read below as I make a diary of what it's like to work a day in the life of an ER nurse. 5:20: Up and at 'em. I get coffee before the shower, because I stayed up too late watching a certain show's season finale. A young Whitehorse man is in a Boston hospital with a broken back and other serious injuries he suffered while jumping his snowmobile at an extreme sports event in New Hampshire. Darryl Tait, 19, has a reputation as a whiz at snowmobile aerial displays, his uncle Russ Tait said. Yukoner Darryl Tait hopes to be one of the first athletes representing Canada in adaptive surfing if the sport is successful in its bid to eventually become a Paralympic sport. Surfing will be part of the Olympics for the first time in 2020, but adaptive surfing - surfing for people with disabilities - hasn't developed to a stage where it can be part of the Paralympics. Darryl Tait says a new trail in Whitehorse - which allows anyone to access a spectacular view of the Yukon River - means a lot to him. "To me, it speaks of freedom," says Tait, who uses a wheelchair and knows how tough it can be to access the outdoors. Crime Scene Investigators, or CSIs, are the first professionals at the scene of a crime. Their role involves gathering and preserving evidence and interviewing civilians to gather more information on the crime. A Canadian competitive snowmobile jumper who permanently lost the use of his legs in a crash last month in the eastern U.S said he refuses to allow his injury to end his active life. Darryl Tait, 19, said he is getting stronger and looking forward to returning home to the Yukon in a few months from Vancouver General Hospital. A Whitehorse man is heading to Texas next week for a wheelchair-motorsports competition and exhibition. Darryl Tait is becoming known in the United States, where he has competed in the Winter X-Games and extreme sport events. He lost the use of his legs in a snowmobile crash five years ago. But when it comes to getting around in downtown Whitehorse in the winter, the paraplegic extreme sports enthusiast admits there are challenges. "My biggest issue here for snow, is snow removal and awareness," said Tait, pointing out a designated accessible parking spot filled with snow, on the corner Main and Front Streets. Although we began the video "How to be Happy - the Secret to Authentic Happiness" which was a review of Martin Seligman's book of the same name (please see the notes from week 1 below.) Students continued to practice using note taking structures. Tuesday we attended the mini assembly that begins every year and semester. Students also participated in the annual school survey. Their honest responses are very much valued, as we use the data gathered to help us - as a staff - to inform school policies and growth. Upcoming course selection and new courses that will be available to them next as they move into their senior years. No vaping paraphernalia of any kind is permitted on school grounds. Students observed to be in possession of any smoking, vaping, alcohol or drug related substances, equipment or materials will have those materials removed. Vapes will be held in the office pending pick up by parents at the end of the school day. A second instance will result in the vaping paraphernalia being held until the end of the year. For further clarification on these policies, please contact the school office and speak to an administrator. Earlier this year, in the initial assembly, it was made clear to the students that now that they are in grade 10, they are part of the graduation program. Missing a significant number of classes will result is tremendous difficulty achieving success and earning credits. PCSS policy is based on research which demonstrates that missing a certain percentage of content and skill building opportunities compromises the possibility of acquiring mastery. The 5-10-15-20 pyramid was discussed, and students were reminded that in grade 10, persistent truancy or tardiness has both academic consequences (lack of progress and mastery) and behavioural consequences (contact home, time served in detention, possible administration-assigned consequences). 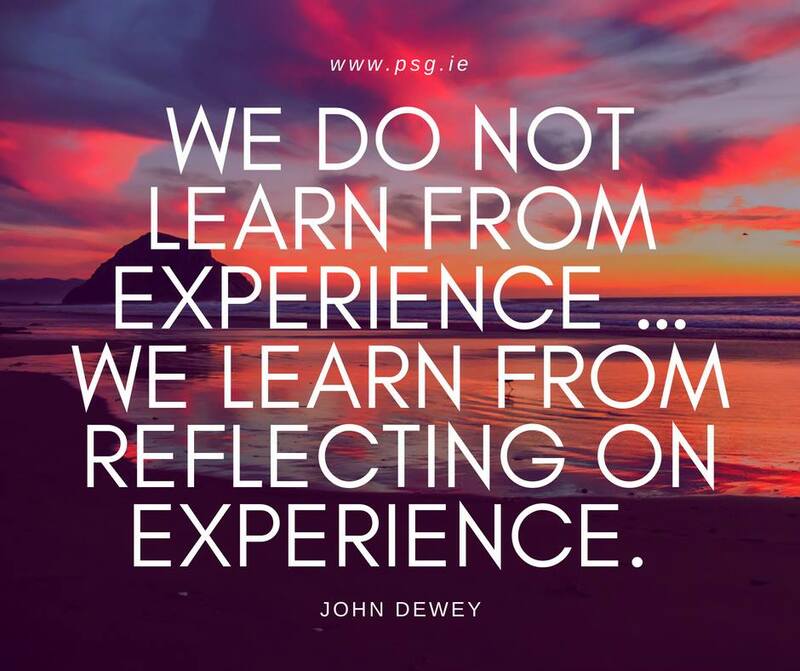 A significant component of the course content and competencies focus on the importance of taking time to engage in self-reflection and self-assessment activities in order to have accurate, complete and insightful information to include in our decision making and in documentation designed to help find success in the world of work. This will be the focus of our work for the next several of weeks. In particular, we will be considering different self-assessment tools, their accuracy and efficacy, and will then correlate information from several sources to begin gathering a self-inventory of strengths and priorities which can be used in setting goals and researching future pathways. To that end, this week we watched a video about University of Pennsylvania psychologist and author, Martin Seligman's book, Authentic Happiness. We discussed how certain elements of this video might be approached differently, and took notes on the differences between 'hedonistic' and 'authentic' happiness, the differences between jobs, occupations and 'callings', and the six core virtue categories that encompass the twenty-four personal strengths Seligman has studied and tracked. Please see a summary of the key ideas from the video in the charts below. You do not "take your work home"
While Quality of Life Indicators can give an idea of how many privileges and/or conveniences someone has access to, they do not necessarily equate to a sense of living a life that is of good quality. Someone living in a safe and wealthy country, in general good health, in a safe environment, with an average family, a good education and healthy social life may well feel as though their life is meaningless or empty. If these indicators are not accompanied, for any given individual, with a sense of meaning/purpose, significant belonging, positive self-perception/storytelling and moments of transcendence/flow, the experience of these wonderful elements of life may be diminished or negated. It does not mean that a person is ungrateful for the benefits of good quality of life indicators but that more substantive and deeply personal connections to their world may be lacking or damaged. The strengths studied by Seligman fall into categories, referred to as the 6 Core Virtues. There is consideral overlap between many elements of these virtues and the strengths and the 7 Grandfather Teachings we examined in class as the foundation for classroom expectations. It should be noted that these virtues and strengths are not a comprehensive list of all strengths and virtues a person may have or demonstrate. Note: despite the commentary in the video, for some people a largely 9-5 schedule (or shift work or piecework or or or) may be enjoyable or rewarding to any given individual. Further, some people find their purpose and meaningful connections and activity outside of their money-earning endeavours. This is highly individual. ​The real key is to find work that does not drain you, particularly not to the point that you have no energy to devote to self-care, relationships (belonging), enjoying moments of transcendence, and engaging in activities that are your "zone" because you are too busy doing only things that leave you spent and empty. Sometimes, it can take decades of effort to make a living out of our purpose and it may never happen. THAT'S FINE! It is important, however, even vitally necessary to our health and success that we balance the activities that help us to meet our physical needs for shelter, food, health care, etc, with the activities that meet our social and personal emotional and intellectual needs, whatever they may be. Key takeaway - "happiness" or "enjoyment" is only fulfilling as part of a larger picture that includes applying our strengths and skills in the context of being true to our values, priorities and moral character. These are the countries with the highest quality of life, according to the not-for-profit organization Social Progress Imperative. Mirror, Mirror ... who am I? Who do I want to be? In this section of the page, you will find a series of links and resources to help students to complete the ongoing project of their Self-Assessment task. This week, students have 2 periods booked into the computer lab. One is one Wednesday, January 30th (I am a professional development session and the class will be overseen by a sub and the EA) and one is on Friday, February 1st. When I return on Thursday, January 31st, we will be examining some of the limitations of the available self-assessment tools. I will add those sources/resources after they have been introduced and discussed. The document below represents the ENTIRE assignment. For the work period on January 30th, students are encouraged to on the first two or three items on the chart found on the second page. In order for students to properly log on to the school computers and to save their work, they are STRONGLY encouraged to ensure that they have created their Rapid Identity Log In (please see directions below) and to save the results of their surveys on a USB by taking screen shots or copying and pasting materials into a word processor documents and/or a slide show document. It is up to students to record their results for use in the summary project final product. Students have several choices of how to publish their results and reflections but they will need the information from their surveys in order to do so. Please note that we viewed this video in class and discussed the content. Students were encouraged to take notes on the psychological effect explained in this TED video, particularly to put their notes in their own words/to summarize ideas. Students: IF you have not yet signed in and set your Rapid Identity, please do so! You will need this for the remainder of your academic career in the Yukon. Students will immediately be prompted to create a new password. It is STRONGLY recommended that passwords be phrase-based. While numbers and symbols are not required, they can help with identity protection and security. Most important is that students choose a password that they will remember. OPPOSITES ATTRACT You share the same elements as the Brain Type opposite yours - they are at different ends of the same spectrum. Other assessments can be taken as a matter of interest and to add context and perspective. The Your Morals test is scientifically valid and rigorous, and will be useful in the section of the project in which students identify their personal priorities and values. I've included a link to www.123test.com . Keep in mind that the free tests available there tend to be demo versions or overly simplified so the results should be taken with an extra grain of salt; nonetheless, they can provide additional perspective when considered in light of other assessment results. Buzzfeed quizzes are for entertainment purposes but students could take one or two and reflect on the ways in which their results either align with or seem to be contradictory to their other results. How will YOU show what you know? Student proposed idea - if you have another idea, please talk to your instructor about it and we'll see how we can work with your intentions. To the right is a brief example of ONE way students could choose to publish and present their collated information from their reflection inventories, their priorities and values worksheets, and their goal setting worksheets. iBooks Author is software available on all school computers. IF a student wanted to go this route, they could either share the digital file with me, or they could print out a copy as a PDF. Recall that printing it as PDF would make interactive features null. The information is supported by visuals. There is a consistent theme and layout. There is background information on what self-reflection entails and what purpose it can/does serve. It includes all general elements (it is missing a day by day goal setting but focuses on experiential, learning and contribution goals). I have analyzed my results and compared them to each other and to my current personal and professional life. PLEASE NOTE: This is not intended to imply that a student who wants to achieve at the "Exceeding Expectations" level must use this format. Instead, it is a sample of the level of detail, analysis and synthesis I would expect for that result. This is a major project, reflecting the learning from the first quarter of the course, and should reflect a substantial amount of effort to incorporate a significant body of information. The sample project below is an example of a project that would land in the "Meeting Expectations" level of achievement. I created this project using a PowerPoint template from Presenter Media, one designed to act as a dynamic résumé. In order to make it visible on the site here, I have exported it as a PDF. The information is complete, but not detailed. It includes all general elements. There are connections made between my results and compared them to each other and to my current personal and professional life. For more information, please see the "Classroom Expectations & Code of Conduct" tab on the main page of this teacher site. We discussed the 7 Grandfather Teachings framework used in this class to help us make effective, healthy and learning-supportive choices, and to self-assess our choices after the fact. We discussed the Annishnabe traditions behind these teachings, the fact that they are also common to Yukon First Nations teachings and what these traditional values look like in a modern classroom. Please see the image below to see the posters that are featured at the front of the classroom. Referring to these will be our touchstone for the semester. While these values are taught as a interconnected set in Annishnabe cultures, that is fairly recent, and, as one local Elder pointed out, these are values held in common by cultures around the world. We also began discussing some of the ways in which the classroom mimics the real world in the sense of earning credits being similar to earning money, and some basics about how the resources of a community (whether it's a school or a country) put the value in the currency of that community. This forms the foundation of the expectation that students will treat this classroom as a work-learning space and being a student as their job. Behaviours that might be expected or accepted in person, private or other casual social contexts may not meet the expectations for a collaborative work space like a classroom. This is an opportunity for students to practice the self-regulation needed to balance their personal preferences and expression of opinions with being members of a larger group of individuals. Students have been reminded several times that each of them bring something unique to the classroom, bring value to the learning environment, but that they are no less nor more important than any of their peers. ​In terms of curricular competencies, we began working on using a note taking system - in this case, specifically the Cornell Note Taking System, as a means of recording information in preparation for assessment and evaluation tasks. Students were informed that for this video they needed to practice using the Cornell Note Taking System in order to practice using a structured note taking system, but they were also introduced to other note taking methods/structures. Handouts were provided. Please see links below. We also began looking at some of the concepts we will be addressing in relations to career planning and life balance, specifically the difference between "happiness" and "meaning", as per the work of renowned psychologist Martin Seligman, researcher, author of "Flourish" and founder/director of the Penn Centre for Positive Psychology at the University of Pennsylvania where he established the PERMA model based on extensive research. The Positive Psychology Centre at Penn State University developed the VIA Strengths Survey, one of the key self-assessments students will be using in the Self-Assessment and Mapping unit that makes up the opening third of the course. Here is a brief summary of the content of Emily Esfahani Smith's TED Talk on a life that goes beyond "happiness" to being meaninful. Being valued by others for your authentic self. Based on human connection rather than on feeble commonalities like hating the same people - inclusive vs. exclusive. While it may be enjoyable, the meaning is derived not from what we get out of it, but from what are contributing to our communities. Being "in the zone", doing something so inherently rewarding or fulfilling that we may not notice that time is passing, sometimes called "Flow". Our primary story is our own - our experiences, our interpretations, our priorities, and how we see ourselves. and a summary section to get the information into it's more condensed but clear form. A physical layout that is consistent and easy to navigate. and reviewing cue columns and summaries to prompt recall. 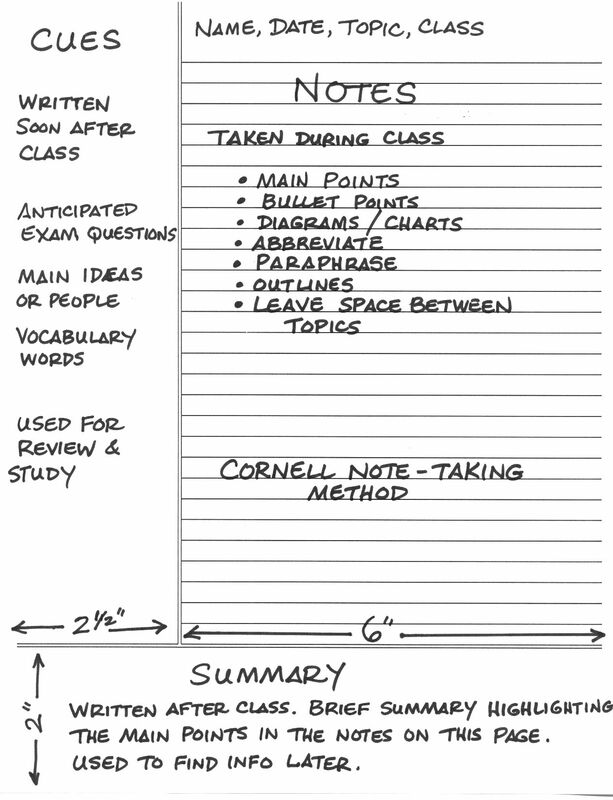 Here's a visual template of what a page set up for Cornell Notes-taking system would look like. This can be on a sheet of ruled, hole-punched paper. 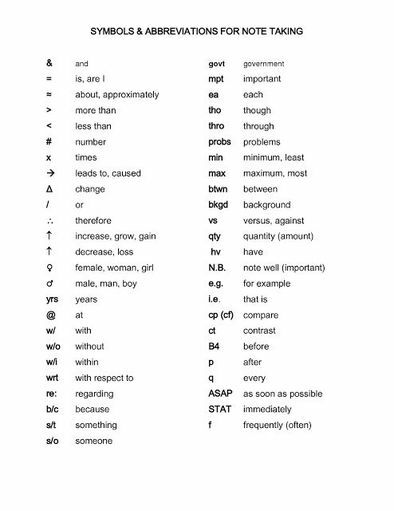 This can be on a notepad or in a notebook. This can be on a blank sheet of letter sized, legal sized or even tabloid sized paper. This can be single of double sided. Students are free to, even encouraged to, include icons, sketches, images, mind-maps, diagrams, colour-coding, and use note-taking abbreviations (please see below) to integrate visual learning with text based learning. This is the physical layout of a Cornell Notes-taking page. The links below offer summaries (including pros/cons/ideal uses) of the five most commonly used note-taking systems. They include images and examples. It is, perhaps, most important to note that none of these must be used for every subject, or every circumstance and that they can be combined to suit the personal skills, preferences and needs of the student making the notes. Students were provided with an annotated hard copy of the PDF from University of Redlands (California). Written by Elizabeth Lundin Table of Contents arrow 2 Prepare Well Before You Get to Class The 6 Best Note-Taking Systems Should You Use Your Computer to Take Notes? Get the Most Out of Your Notes Heading off to college is kind of like leveling up in a video game. Note-taking is one of the most important activities for students. There are a variety of reasons for it but we only want to highlight the most important one here: Taking notes will help you recall information that would otherwise be lost. And we all know how crucial that can be when we're preparing for an exam. If your in-class notes are messy, unorganized, and unclear at first glance, you're not going to get much use out of them. This has nothing to do with how neat your handwriting is - it's all about how your notes are structured.